It’s Jungle January so I’ve made jungly underwear! This is fabric left over from another, as yet unblogged, make. It is a stretchy viscose and is so, so, soft. The pattern is the Watson bra and undies, and for this one I focused on getting the inside of the bra neatly lined. Firstly I sewed the back band and the cradle and the cradle lining together, enclosing the lining in the seam. That was the easy bit done. Next up I needed to join the cups to the cradle. I turned them inside out, and then I sewed them on one at a time, tucking the cradle between the two layers. This was really difficult to photograph. What I did was take the right side of the cup lining and the right side of the cradle lining and pin them together. Then I tucked everything inside and pinned the right side of the outside cup to the right side of the outside cradle, This reminds me of sewing shirt yokes where the whole shirt is rolled into the yoke. Forgive me if you have no idea what I’m talking about! Here is a photograph of what you finish up with – it’s like a little parcel. The bit of white you can see is the bottom edge of the cradle. This bit is a fiddle and took multiple pinnings to get it right. Snip the pointy bit at the centre of the cradle and this will make it easier. Just keep in mind that this can be done! When you have done this for both cups, you need pull them right side out through the unsewn side seam of the cup, and then topstitch. 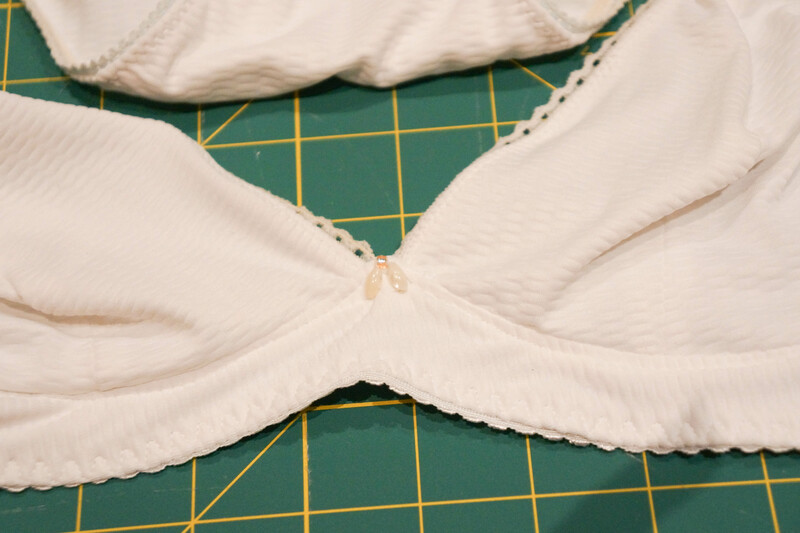 Unfortunately, because of the construction method, you have to topstitch around the cup, rather than around the bra band as the seam now points up instead of down. This doesn’t seem to make any difference to the comfort. This is what the inside looks like now, including a bit of offline topstitching! The rest of the bra came together as per the instructions. All the remaining raw edges are hidden under the elastic, so I didn’t worry about doing anything tricky. ** After I had done all this and written this part of the post, I remembered that Carolyn had done a tutorial on how to do this. I revisited her post and felt that we had sufficient differences to make my post worth putting up. I will say though that Carolyn’s method looks easier than mine! The last thing left to do was to put a little trim on the bra. I used two sequins and a tiny bead. Then I found a hole right in the front on the undies – gah! So I darned it and covered it with the same trim. Looks alright! This is the second Watson set made with the regular cradle, and my first attempt at getting the inside neatened in an organised fashion. I made this white lycra set before the jungly set and found it to be amazingly comfortable, and is my favourite underwear set to date. I used drop beads to finish off the bra on this set. With this lovely jungle print, your set could almost be worn as a 2-piece bathing suit. Your instructions (and Carolyn’s tutorial) will come handy when I join the bandwagon. But right now, this seems overwhelming given my sewing skills. To be honest, Hélène, if you can do basic sewing, you can make these. Perhaps start with the bikini and see how you go? A great looking set and perfect way to use up the scraps. Now to get myself organised for the sewalong. Yes, I thought I might take a passing interest in the sewalong in case there’s a better way of doing some of this. Great set of underwear. When will you start taking orders?! haha! Victoria’s Secret I am not! Another tempting Watson! Love the fabric, totally adorable and definitely jungle-y. Thanks for the tutorial, it’s helpful to know multiple techniques for the same end result. Previous Post Flat Bottom Flo Pants.